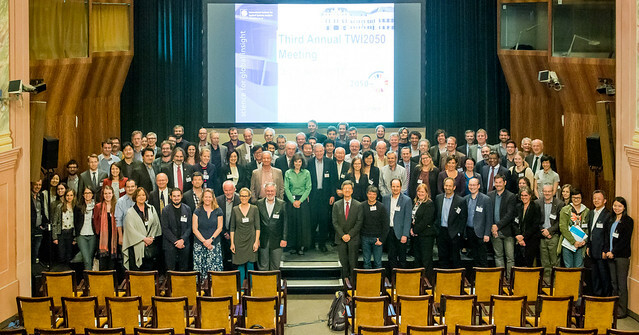 On 3-5 April 2017 120 scientists from leading research institutes met for the annual workshop of the World in 2050 (TWI2050) project. The World in 2050 (TWI2050) is a partnership between science and policy that aims to develop pathways toward sustainable development within planetary boundaries. TWI2050 aims to address with an integrated and systemic approach the full spectrum of transformational challenges related to achieving the 17 Sustainable Development Goals (SDGs) and reach the desired just and safe target space for people and planet by 2050 and beyond. Today, no science-based pathways exist for successfully achieving all SDGs. This approach is the first goal-based, multi-model quantitative and qualitative integrated analysis that encompasses the full set of SDGs. The first sustainable target space for 2030 is based on the 17 SDGs and the second for 2050 and beyond is defined through a set of indicators and those are used to backcast achievement of sustainable future development pathways from 2050 and beyond through SDGs in 2030 as illustrated in Figure 1. Figure 1: TWI2050 Framework: The illustrative graphic shows alternative sustainable development pathways (SDPs) that reach the two defined target spaces: all 17 SDGs and the transformation toward sustainability within planetary boundaries beyond 2050. An overarching narrative (grey) on sustainability transformation motivates the TWI2050 framework. Source: based on (WBGU 2011). TWI2050 initiative brings together a network of leading policymakers, analysts, modeling and analytical teams, and organizations from around the world to collaborate in developing pathways toward sustainable futures and policy frameworks needed for implementing the SDGs, and more importantly, for achieving the needed transformational change. The first step was to describe this approach and methodology in a science paper drafted by TWI2050 community that will be presented and discussed during the Annual Meeting. The second is to further refine the indicators of the target space and the plan is to do this in parallel sessions based on the clustering of SDGs shown in the Figure 2 below. There are many possible clusterings and none of them should be seen as a way to divide the SDGs as they need to be achieved holistically. In fact, the major objective of TWI2050 is to understand possible trade-offs and synergies among the SDGs as well as the dynamics that could emerge toward 2050 and beyond. Figure 2. The World in 2050 [TWI2050] framework for Sustainable Development Pathways (SDP) of attaining the SDGs within Planetary Boundaries by 2050. The SDGs are universal, holistic and inter-dependent, thereby indivisible. The indicative clustering of the SDGs proposed here, has the sole purpose of emphasizing the inter-dependence between human wellbeing, world development and Earth system stability. In addition to the plenary six parallel sessions were planned, one per SDG cluster, to further refine the target space indicators, their ranges and characteristics by 2050 and beyond, and how they are related to other SDGs and each other. The parallel sessions also assessed the dynamics of backcasting from target space to a number of systems, such as energy or urbanization. The plenary sessions served to integrate the results of the parallel sessions and develop a holistic approach that can be used to refine the transformational pathways to 2050 and beyond and their underlying narrative. Finally, future activities and products were also planned during the Annual Meeting. O'Neill BC, Kriegler E, Ebi KL, Kemp-Benedict E, Riahi K, Rothman DS, van Ruijven BJ, van Vuuren DP, et al. (2017). The roads ahead: Narratives for shared socioeconomic pathways describing world futures in the 21st century. Global Environmental Change 42: 169-180. DOI:10.1016/j.gloenvcha.2015.01.004.